I'm in the process of preparing my honeybee hives for winter. 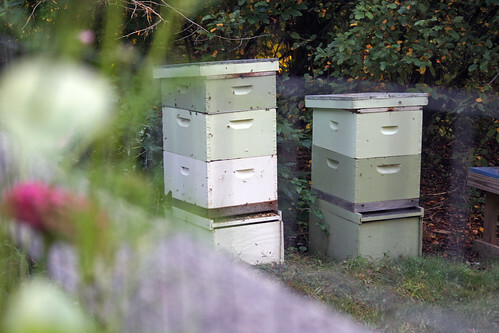 I have two hives on the far side of my vegetable garden nearest the pond. They're on the northeast side of the yard with a southwest exposure. Both were packages I installed in early April, since both my hives died early last winter. One hive is much stronger than the other. The strong one has about 70 lbs of honey, while the weak one about 30-40 lbs. I'm guessing here from lifting the boxes. - Removed super and extracted honey: In early September I removed one full super (a short box with 10 frames for building comb and filling it with honey) from my strong hive. I've extracted it into a bucket and will bottle in 4 lb jars soon. It'll be about 20 lbs plus or minus I think. - Feeding weak hive: I've been feeding my weak hive so it can build up its honey stores for winter. There aren't many flowers left now, the goldenrod is gone. I only see the late aster in bloom now. The bees can't get much nectar from foraging anymore. I feed a 1:2 mix of water and sugar. - Fed strong hive: Yesterday I put the super with wet frames (the same super I extracted, but since I only extracted about 80% of the honey, meaning 20% is still in the combs, it's called a wet frame) onto the strong hive. sat exposed for a while. Somehow, I also dripped some honey on the ground in front of the hive. and covered it up. Nevertheless the frenzy continued all day. - A couple of mistakes to avoid! - Get bigger feeding bucket: I've been feeding the weak hive about a liter at a time, but they eat it so fast I can't keep up with them, The bucket seems always empty. They only have a short time left when they can dry down the sugar water and store it as honey. Once it gets cold, they need all their energy to stay warm. So I'm planning to add a bigger container of sugar water today. I'm using a chicken water feeder with bent hardware cloth in the tray so the bees can climb down the the liquid. - Count mites: I'm planning to do a sugar roll to count mites in both hives. I haven't treated for mites, but I'd still like to know what the load is going in to winter. - Full inspection of hives: I plan to go through both hives, frame by frame, and get a good count of how much honey and brood are there. I'll check for the queens, and make sure they're laying well. - Build a box to absorb winter condensation: I'm planning to build a box (called a quilt box) that sits at the top inside the hive and insulates, helps with airflow, and absorbs moisture. I will staple burlap to the bottom of a super and fill it with wood shavings. Pretty simple design. (I have to find out if it should go above or below the top board.) I'm hoping it will help. It's my guess I lost my hives last year because of condensation dripping into the cluster of bees. 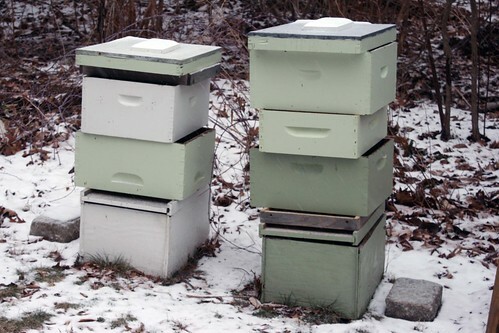 Bees can stay warm in cold weather, but not if they're wet. My hive are very close to the pond and we get lots of local fog from it. - Remove super. I'll take off the super with wet frames from strong hive once its dry and all of the honey has been brought down into the hive. After this, they should be ready to go for winter. At least as ready as I can get them. Of course, I can always use advice. I've been keeping bees 3 years now, and have plenty more to learn. I learned from my class, from experts at my local bee club, from advice on this blog, and from my bees (trial and error). But still I almost never spot a queen, I'm very bad a string a smoker and keeping it going, haven't had the time to do mite treatments or sugar rolls yet. And I've only had 1 of 4 hives survive a winter. But I have produced over 150 lbs of honey so far. Really delicious honey. And me and the bees have fun hanging out in the garden. :-( The boxes of both my hives are now empty and stacked crosswise. I was sad to see so many bees die. I'm guessing they died from dripping condensation as I saw water droplets in the hive when I opened it. I noticed bees begin to die in November, just after it got cold. 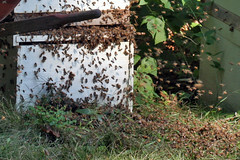 They fell from the hive in huge numbers. Mostly they couldn't get cleaned out through the mouse guard, so they accumulated on the floor of the hive and I brushed them out. Both hives. I knew it wasn't good. So, it could have been mites. I've never treated for them, or tested. I've only ever seen one on a dead bee. I know they're mostly in larvae, and they reduce hive numbers. Mites are thought to be a large contributor to colony collapse disorder (CCD), where adult bee populations effectively disappear suddenly, within a few weeks or days. My bees didn't disappear, they were right there - piles of dead ones. I didn't see signs of any other diseases: foulbrood, nosema, wax moths, or hive beetles. I forgot to call the bee inspector, who probably would have a had a helpful opinion for me. So I'm going to blame the moisture I saw in the hive. Bees can keep themselves warm but not if they're wet. They vibrate their wings and create heat for the cluster. They can't do this if they have water dripping on them. My hives are located 40-50 ft from a large pond, on pretty much the same level as the pond. We enjoy watching clouds of moisture rise from the pond on cold mornings. They are quite beautiful. I've been reading about condensation in bee hives and elsewhere (e.g. our new garage ceiling...). If the top of the hive is cold, the inside is warmer, and the humidity is high, water will condense inside the top. Humidity is worse if there is poor air circulation. 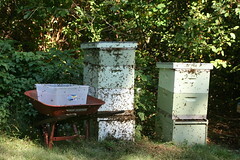 - Move the hives to a higher site, further from the pond. This will be either in my new fruit tree "mini-orchard" on an open south slope 200 ft from the pond and about 30 feet elevation - or in my front yard, twice as far away and twice as high. - Add a "quilt box". I'm still looking into how to built this. It's essentially a short hive box with a porous bottom filled with absorbent wood shavings and ventilation holes in the sides.